Chairperson of the symposium on Nephrology in the 12th Asia Pacific Congress of Paediatrics and 2nd Asia Pacific Congress of Paediatric Nursing 2007. Chairperson of the XVII Annual Conference of Indian Paediatric Nephrology Group (IPNGCON) November 2006. Resource person of the workshop on Practical Nephrology organised by the Uva Provincial Directorate of Health Services on 15th February 2005. Resource person and the Organiser of the pre congress seminar on Nephrology at the 27th Annual Academic Sessions of the Kandy Society of Medicine 10th – 12th February 2005. Resource person in the Continuing Medical Education Programme organized by the Clinical Society of Base Hospital Gampola on “Early Nutrition in Adult Disease”. March 2005. Resource person in the Continuing Medical Education Programme organized by the Clinical Society of Base Hospital Nuwara Eliya on “A child with urinary tract infections” July 2005. Resource person in the Continuing Medical Education Programme organized by the Provincial Director for Health Services on “Renal Diseases in Childhood” November 2005. Resource person in the Continuing Medical Education Programme of the Kandy Society of Medicine “Management of Childhood urinary tract infections – Common pit falls” 2004. Resource person in the Continuing Medical Education Programme of the Kandy Society of Medicine “Management of Dengue Fever” 2004. Resource person of the Symposium of Paediatrics organized by the College of General Practitioners “Management and Prevention of Renal Disorders in Childhood” September 2004. Chairperson of a free paper session at the 26th Annual Academic Sessions of the Kandy Society of Medicine 5th – 7th February 2004.
at the 7th Medical Exhibition 2003. Resource person of the Act 16 Revision Course in Paediatrics affiliated to the 6th International Medical Congress 2002. Resource person of the symposium on the Management of Paediatric Problems in In-service training programme for junior doctors organized by the Kandy Society of Medicine in collaboration with Provincial Health Department, Kandy April 2002. Guest Speaker at the International Paediatric Nephrology Week (March 2001) held at the Institute of Child Health, London UK. Orator of the Professor CC De Silva Memorial Oration of Sri Lanka College of Paediatricians, 2002. •Orator of the Professor CC De Silva Memorial Oration of Sri Lanka College of Paediatricians, 2009. 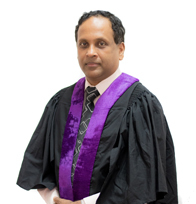 Abeyagunawardena A, Karunadasa U, Jayaweera H, Thalgahagoda S, Tennakoon S, Abeyagunawardena S. Efficacy of higher-dose levamisole in maintaining remission in steroid-dependant nephrotic syndrome. Pediatric Nephrology. 2017;32(8):1363-1367. Abeyagunawardena A, Thalgahagoda R, Dissanayake P, Abeyagunawardena S, Illangasekera Y, Karunadasa U et al. Short courses of daily prednisolone during upper respiratory tract infections reduce relapse frequency in childhood nephrotic syndrome. Pediatric Nephrology. 2017;32(8):1377-1382. Kudagammana S, Thalgahagoda S, Abeyagunawardena S, Karunadasa U, Abeyagunawardena A. Efficacy of Levamisole as a single agent in maintaining remission in steroid dependant nephrotic syndrome. Sri Lanka Journal of Medicine. 2017;26(1):13. Harrischandra P, Jayatunge D, Rambukwella U, Sumithraarachchi I, Karunadasa U, Abeyagunawardena A. First experience of cadaveric renal transplantation in Sri Lanka. Ceylon Medical Journal. 2017;62(2):83. Thalgahagoda S, Abeyagunawardena S, Jayaweera H, Karunadasa U, Abeyagunawardena A. Pulsed Vincristine Therapy in Steroid-Resistant Nephrotic Syndrome. BioMed Research International. 2017;2017:1-4. Thalgahagoda R, Jayaweera A, Abeyagunawardena S, Karunadasa U, Abeyagunawardena A. Slow Infusion Vs Bolus Injection of Frusemide in Treating Oedema in Nephrotic Syndrome: A Randomised Controlled Trial. International Journal of Scientific Progress and Research (IJSPR). 2017;33(92):7-9. Thalgahagoda R, Abeyagunawardena S, Jayaweera A, Kudagammana S, Karunadasa U, Abeyagunawardena A. Intravenous Pulsed Cyclophophamide versus Intrvenous Vincristine Therapy in Steroid Dependent Nephrotic Syndrome: A Randomised Controlled Trial. International Journal of Scientific Progress and Research (IJSPR) 2017;33(92):10-12. Abeyagunawardena A, Goldblatt D, Andrews N, Trompeter RS. Risk of relapse after meningococcal C conjugate vaccine in nephrotic syndrome. Lancet. 2003;362:449-50. C K Abeysekera, N Kumarasingha, J C Rathnatilake, S H Pathirathne, A S Abeyagunawardena . Children with Chronic Kidney Disease. Proceedings of The 12th Asia Pacific Congress of Paediatrics and 2nd Asia Pacific Congress of Paediatric Nursing 2007;1(1): 72.